We recommend setting up a winback campaign to re-engage customers after a fixed number of days. This page shows you how to setup a 90 day winback campaign that targets customers either 90 days after their last purchase, or after 90 days of inactivity. The first segment we will create will target people 90 days after their last purchase. We will use the Last Purchase option in the Segment Builder and define a window of time that encompasses 90-91 days ago. Name the segment: 90 Days Since Last Order. Under the Engagement tab scroll down to Last Purchase. The starting date field (left hand date field) select Relative, then 91 days before now. We can also define churn by lack of interaction with your brand. In this segment we will define a churned customer to be someone who has not had a pageview or opened an email in the last 90 days, but engaged in the previous 180 days. Name the segment: 90 Days Interaction Churn. Build a sentence for Count = 0 for Email Open on or after 90 days before now. Build a sentence for Count = 0 for Pageview on or after 90 days before now. Build a sentence for Count > 0 for Email Open between 180 days before now and 90 days before now. Build a sentence for Count > 0 for Pageview between 180 days before now and 90 days before now. Create a new campaign and configure it to use the segment you defined for your winback audience. 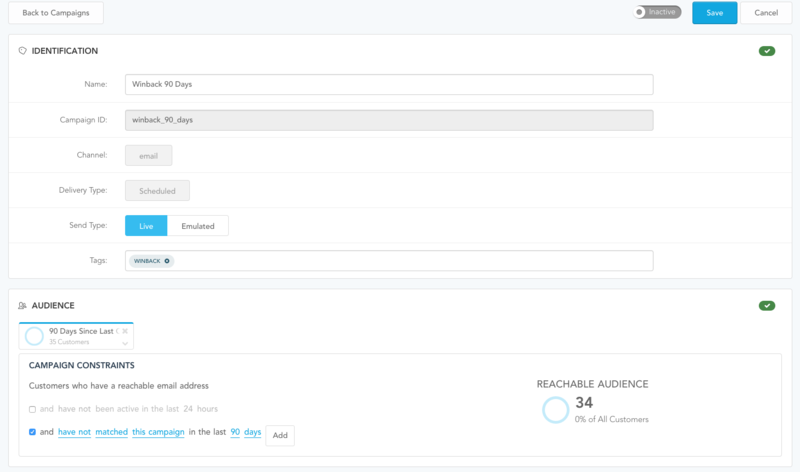 Adjust the campaign constraints to ensure that customers only receive this email at most every 90 days by adding a campaign constraint: and have not matched this campaign in the last 90 days.